The class II transactivator (CIITA) is a master regulator of MHC class II expression. CIITA also modulates the expression of MHC class I genes, suggesting that it may have a more global role in gene expression. To determine whether CIITA regulates genes other than the MHC class II and I family, DNA microarray analysis was used to compare the expression profiles of the CIITA expressing B cell line Raji and its CIITA-negative counterpart RJ2.2.5. The comparison identified a wide variety of genes whose expression was modulated by CIITA. Real time RT-PCR from Raji, RJ2.2.5, an RJ2.2.5 cell line complemented with CIITA, was performed to confirm the results and to further identify CIITA-regulated genes. CIITA-regulated genes were found to have diverse functions, which could impact Ag processing, signaling, and proliferation. Of note was the identification of a set of genes localized to chromosome 1p34-35. The global modulation of genes in a local region suggests that this region may share some regulatory control with the MHC. By mediating both constitutive and IFN-γ inducible expression, the class II transactivator (CIITA)3 functions as a master regulator of MHC class II genes (1, 2). CIITA acts through a compact series of conserved cis-acting elements termed the W/Z, X1, X2, and Y boxes found 100–200 bp upstream of all MHC class II isotypes (reviewed in Ref. 3). These cis-acting elements are also found upstream of the invariant chain, HLA-DM, and HLA-DOA genes, which are coordinately regulated with the classical MHC class II genes (4, 5). Several years ago, it was discovered that MHC class I and β2-microglobulin genes, which are expressed constitutively, also contained WXY sequences, and that CIITA could directly augment their expression through these elements (6, 7). We recently found that the expression of HLA-DOB is decreased in B cells lacking CIITA (8), implying that its expression is modulated by CIITA as well. Thus, the expression of a large number of genes involved in Ag processing and presentation is controlled either completely or in part by CIITA and the class II regulatory pathway. Genetic deficiencies in CIITA and members of the RFX complex RFX-B/ANK, RFX5, and RFXAP (9, 10, 11, 12) are the basis of the bare lymphocyte syndrome, a series of rare autosomal diseases that manifest in a severe combined immunodeficiency (reviewed in Refs. 13 and 14). Cell lines established from bare lymphocyte syndrome patients have provided key reagents for the elucidation of the molecular mechanism of CIITA function and MHC class II regulation. CIITA does not directly bind to MHC class II promoter DNA, but appears to exert its function by interacting with MHC class II DNA-bound transcription factors RFX, CREB, and NFY (1, 15, 16, 17). The RFX complex, CREB (16, 18), and NFY (19) bind to the X1, X2, and Y box motifs, respectively. CIITA’s role in activating gene expression appears to be through the recruitment of components of the basal transcription machinery (20, 21, 22, 23), as well as histone acetyltransferases that acetylate the local nucleosomes (15). CIITA has also been reported to possess intrinsic acetyltransferase activity (24). Besides its role in class II regulation, CIITA has also been shown to down-regulate IL-4 (25), Fas ligand (26), and collagen α2 expression (27). This down-modulatory activity has been suggested to be due to CIITA’s ability to titrate CREB-binding protein (CBP) from the promoter/enhancers of these genes. Thus, CIITA has the ability to regulate genes by at least two mechanisms: the MHC-class II regulatory pathway and by titration of limiting transcription factors/coactivators. The fact that CIITA can positively and negatively regulate genes suggests that the presence of CIITA in cells may have broad consequences on global gene activity. To determine whether CIITA regulates genes other than the MHC class II and I family, and to identify novel CIITA regulated genes, DNA microarray analysis was used. The global expression profiles of the CIITA-expressing B cell line Raji (28) and its CIITA-negative counterpart RJ2.2.5 (29) were compared. RJ2.2.5 cells were derived directly from Raji cells by gamma irradiation and selection for the loss of MHC class II surface protein expression (29), and are mutant for both CIITA alleles (1, 30). The results of this comparison revealed a set of genes that appeared to be up-regulated and down-modulated by CIITA. Quantitative RT-PCR analysis using RNA from Raji, RJ2.2.5, and RJ2.2.5 stably transfected with CIITA demonstrated that many of these genes were in fact regulated by CIITA. A subset of the CIITA-regulated genes was tested and found to be induced in fibroblasts following IFN-γ treatment, suggesting that CIITA, which is induced by IFN-γ, can modulate their activity in other cell types. Bioinformatics analysis was used to organize the genes by function and determine their chromosome location. The genes modulated by CIITA were found to have diverse functions, suggesting that CIITA may play a general role in the physiology of cells that are focused on presenting and processing Ags. A set of CIITA-modulated genes was found to be clustered on chromosome 1p34-35, suggesting a novel mechanism of CIITA-mediated gene control. Raji, a Burkitt’s lymphoma derived cell line, is wild type for CIITA and positive for MHC class II gene expression (28). The human B cell line RJ2.2.5 was derived by mutagenesis from Raji cells and selected for loss of HLA class II Ag expression (29). RJ2.2.5 is null for CIITA (1, 30). Raji and RJ2.2.5 were grown in RPMI supplemented with 5% FBS, 5% bovine calf serum, 2 mM glutamine, penicillin (5 U/ml), and streptomycin sulfate (5 μg/ml). A431, a vulvar epithelial carcinoma cell line, was grown in DMEM with 10% FBS and above supplements. A431 cells express both CIITA and MHC class II genes following IFN-γ treatment (15). Total RNA was isolated from cells by the Nonidet P-40-lysis method (31) or the RNeasy method (Qiagen, Valencia, CA). Total RNA (20 μg) was used directly for cDNA synthesis using “The Super Choice” system for cDNA synthesis (Life Technologies, Grand Island, NY) with an oligo(dT) primer containing a T7 phage promoter sequence. cRNA was prepared from cDNA as described earlier (8). Test DNA microarray chips from Affymetrix (Santa Clara, CA) were used to check the cRNA for equal hybridization to 5′ and 3′ oligonucleotides of housekeeping genes before each experiment. Three independent experiments were conducted using the Affymetrix human U95A chips. Prehybridization and hybridizations were conducted as previously described (8). Arrays were scanned on a Hewlett-Packard gene array scanner (Hewlett-Packard, Palo Alto, CA). Data obtained from scanning the U95A chips were analyzed using the Microarray Suite 4.0 (Affymetrix) software package. The fluorescence intensities of all DNA microarray chips were normalized using a scaling factor of 2500 during the absolute analysis so that they could be used in the comparative analysis without any additional normalization. Pairwise comparative analyses were done directly in the Microarray Suite software with the Raji cell data as the experimental chip file and RJ2.2.5 generated data as the baseline. Comparisons were conducted between the data from three Raji and the three RJ2.2.5 DNA microarray chips, resulting in nine data sets, each providing a fold change in expression for each gene in Raji vs RJ2.2.5 or vice versa. This software also provided a difference call of “I” for increased, “D” for decreased, and “NC” for no change based on the average difference change (intensity change) and background noise in the microarray. The results from these analyses were converted to a database using the MICRO-DB software (Affymetrix), which allowed further analysis using the DMT 2.0 software (Affymetrix). The DMT software was used to perform nine comparisons between the three Raji and three RJ2.2.5 data sets, apply statistics, and determine the significance of the differences observed. To generate a list of induced/repressed genes that would be meaningful, two sets of tools were used. First, a frequency test of increased calls was taken from multiple comparisons. Genes with increased or decreased calls in five of the nine comparisons were considered further. From this list, all genes exhibiting small changes in expression (arbitrarily chosen as <1.8-fold) were eliminated from further consideration. Second, to obtain the statistical significance of the fold change values, the absolute analysis of the six chips (three Raji and three RJ2.2.5) were converted to GATC format and a Mann-Whitney U test was conducted on the average differences (intensities) between the sets. Of the data sets that qualified (p values <0.05 in a Mann-Whitney U test), the genes that were absent in both Raji and RJ2.2.5 sets were also removed from further consideration. As above, genes with fold changes <1.8 were eliminated. This provided a list of genes whose average difference was statistically significant. RNA was prepared using the RNeasy method and kits (Qiagen). DNase I-treated total RNA (2 μg) was reverse transcribed using Superscript II RT (Life Technologies) and buffers from an RT-PCR kit (Applied Biosystems, Branchburg, NJ) according to the manufacturer’s direction. A control reaction with all the components except reverse transcriptase was conducted with each RNA sample to check for contaminating nucleic acids. One-twentieth of the reverse transcription reaction was used for quantitative real-time PCR in a reaction containing SYBR-green buffer (5% DMSO, 1× SYBR (BioWhittaker Molecular Applications, Rockland, ME), 0.04% gelatin, 0.3% Tween, 50 mM KCl, and 20 mM Tris, pH 8.3), 3 mM MgCl2, 0.2 mM dNTP, and 100 nM of each primer. A two-step PCR with denaturation at 95°C for 15 s and annealing and extension at 60°C for 1 min for 40 cycles was conducted in an I-Cycler (Bio-Rad, Hercules, CA). PCR using primers for the GAPDH transcripts were conducted in each plate to provide a normalization reference. The primer sets used are listed in Table I⇓. The HLA-DRA and GAPDH primers sets have been previously described (8, 15). The threshold cycle values for all genes were normalized to the threshold cycle of GAPDH and converted to linear scale. All real-time RT-PCR were conducted at least three times from independent RNA preparations. Genomic DNA was isolated from Raji and RJ2.2.5 as described in Ausubel et al. (32). Quantitative real-time PCR assays were conducted using various concentrations (25, 50, 100, and 200 ng) of genomic DNA for importin α 7 (KPNA6), tyrosyl tRNA synthetase (YARS), TGF-β receptor interacting protein (EIF3S2), and RbAp48 (RBBP4) genes. A three-step PCR with denaturation at 95°C for 15 s, annealing at 60°C for 30 s, and extension at 68°C for 30 s was conducted for 40 cycles. The PCR primers used were: KPNA6, 5′-gacttgctggcagatgcttgctg, and 5′-gaccactcacatcagcagctc; YARS, 5′-gtagggtatcacatctgcactgag, and 5′-ccagaacctcctattgtggaagc; and EIF3S2, 5′-gcgaagatggttacgtccgtatcc and 5′-gggattacaggcatgagccacc. For RBBP4, the primers used for RT-PCR (Table I⇑) were used for genomic PCR as they primed a single exon. Public and corporate databases were searched for information about the genes identified during microarray analysis. GenBank accession numbers used by Affymetrix were used to confirm gene identities in searches against GenBank (www.ncbi.nlm.nih.gov/entrez) and LocusLink (www.ncbi.nlm.nih.gov/LocusLink). The genes were grouped based on known or inferred functions using information from LocusLink, Online Mendelian Inheritance in Man (www.ncbi.nlm.nih.gov/omim), the Celera Discovery System, and Celera Genomics-associated databases. Chromosomal locations and transcriptional orientations were determined for human and mouse genes through combined use of LocusLink and Celera databases. Gene symbols are the currently defined official symbols described in National Center for Biotechnology Information LocusLink database and derived from the Human Gene Nomenclature Database. Sequences not identified with a gene name by the Affymetrix software were used to search GenBank and Celera databases using the BlastN or BlastP algorithms. Gene expression profiling using DNA microarrays was used to identify novel genes regulated by CIITA in B lymphocytes. The cell lines chosen for this analysis were Raji and RJ2.2.5. The Raji cell line has been used extensively over the last 20 years as a model cell line for the regulation of MHC class II genes. RJ2.2.5 cells were derived directly from Raji cells by mutagenesis and are defective for CIITA expression (1, 29, 30). The U95A DNA microarray series chip (Affymetrix), which contains ∼12,600 human genes represented in each chip, was used to compare the expression profiles of the two cell lines. RNA samples were prepared from Raji and RJ2.2.5 cell lines for three independent experiments. Biotinylated cRNA prepared from RNA derived from both cell types was used for hybridization to the gene chips and the results analyzed as described in Materials and Methods. Analysis of the constitutively expressed GAPDH and β-actin genes showed that the 5′/3′ hybridization ratios were close to 1.0, suggesting that the quality of the RNA was sufficient for analysis (Table II⇓). Absolute analysis of individual chips was conducted using the Microarray Suite 4.0 software. The overall number of genes designated as “present”, “absent”, or “marginal” by the software was comparable among the three experiments (Table III⇓). On the average, ∼45 and 43.5% of the genes in the chip were present in Raji and RJ2.2.5 cells, respectively, indicating no gross difference between the cell lines. Pairwise comparative and statistical analyses between the Raji and RJ2.2.5 chips were conducted. Genes found to be increased in expression in five of nine comparisons with a fold increase >1.8 and with p values <0.05 (as determined by a Mann-Whitney U test) were further analyzed. Although it was possible that by applying these criteria some genes that differed between these cell lines would be discarded, the increased stringency was selected to help eliminate false positives. Genes found to be expressed at higher levels in Raji vs RJ2.2.5 cells were classified by function based on the results from National Center for Biotechnology Information, Online Mendelian Inheritance in Man, Celera, Basic Local Alignment Search Tool, and MEDLINE searches (Table IV⇓). Genes were mapped to their chromosome locations using information in the National Center for Biotechnology Information and Celera databases. As expected, the HLA class II genes HLA-DRB, -DPA, -DPB, -DQB, -DMA, -DMB, and -DOA were found to be expressed at high levels in Raji and absent or low (background hybridization) in RJ2.2.5 cells. Additionally, HLA-DOB expression was increased in Raji with high concordance. The expression of the heat shock protein (HSP) gene HSP70-2 and TAP1 was also higher in Raji cells. This latter group of genes, residing in the MHC locus, has not been shown to be influenced by CIITA previously. Surprisingly, the fold change for HLA-DRA did not correlate with previously existing data (15). Inspection of the HLA-DRA hybridization data set showed that there was increased hybridization to the mismatch set of negative control probes for HLA-DRA, resulting in a false average difference and decreased fold change. Saturating levels of HLA-DRA mRNA in Raji cells, conditions of hybridization, or poor choice of mismatch oligos for this probe set could have contributed to the false reading. Nevertheless, all other MHC class II genes known to be regulated by CIITA were identified in the gene chip analysis, suggesting that other genes up-regulated would prove valid. Table IV⇑ displays the list of 48 genes up-regulated in Raji cells over RJ2.2.5 cells. Based on their actual or predicted function, the genes were grouped into sets of kinases/phosphatases, transcription factors, cell cycle- and cell structure-related factors, nuclear import proteins, RNA processing components, enzymes, receptors and cell signaling molecules, and chromatin remodelers. The set of genes whose function did not fall into any of the above categories was classified into “others”. Expressed sequence tag (EST) and cDNAs with no known or inferred function were classified separately. 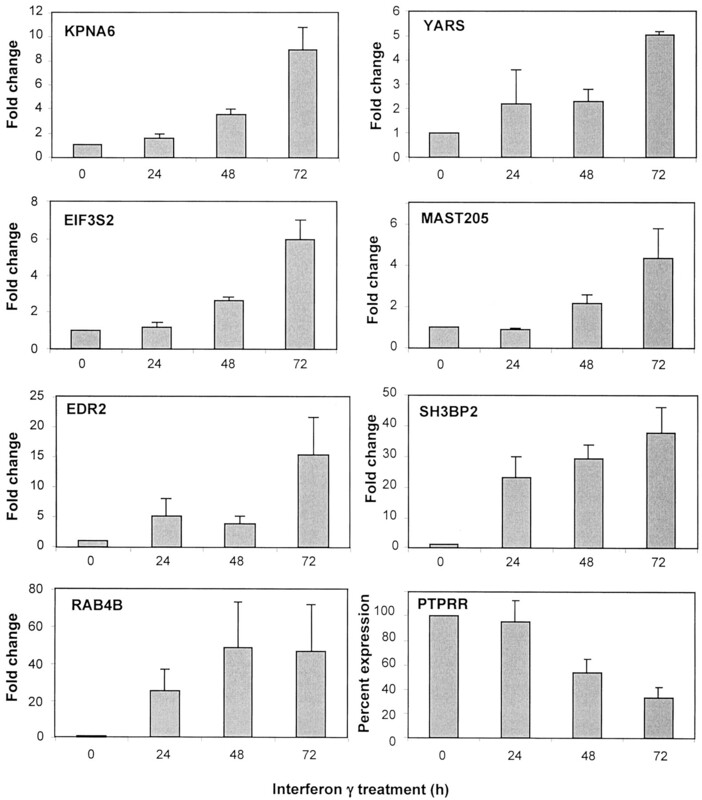 Those genes exhibiting the highest fold increase (Raji/RJ2.2.5) included retinoblastoma-binding protein 4 (RBBP4 or RbAp48), importin α 7 (KPNA6), prolyl 4-hydroxylase α II subunit (P4HA2), SNARE protein (YKT6), and two cDNA clones, PEG10 and KIAA0193. In addition, a few genes such as TGF-βR-interacting protein (EIF3S2) and tyrosyl tRNA synthetase (YARS) displayed a consistent moderate fold change as they appeared in all nine comparisons. Sixteen genes were found to be decreased in their expression levels in Raji vs RJ2.2.5 cells, suggesting that these genes are down-modulated in the presence of CIITA (Table V⇓). Those genes displaying the greatest decrease in expression levels in the Raji vs RJ2.2.5 comparison were protein tyrosine phosphatase (PTPRR), glycoprotein M6A (GPM6A), and kallikrein (KLK1). A set of ESTs displaying homology to IgG H chain-like sequences were also found to be down-regulated; however, the annotation of these sequences is incomplete making it difficult to place these genes in any category or assign function. Together the combined data suggest that CIITA positively and negatively regulates a large number of genes. To validate the results of the DNA microarray analysis, quantitative real-time RT-PCR was conducted on all genes that displayed a 3-fold increase or decrease in expression in the above experiment. In addition, HLA-DRA, HSP70-2, TAP1, and seven other genes with regulatory or potential immunological functions were analyzed. The analysis was conducted with three to six independent RNA preparations and all real-time PCR were performed in duplicate. The results from each assay were normalized directly to the expression of the GAPDH gene from each cell line, which is essentially identical between the cell lines by this methodology. Of the 35 up-regulated genes analyzed, all showed increased levels in Raji cells compared with RJ2.2.5 cells (Table VI⇓). It is important to note that in most cases the real-time RT-PCR fold changes were substantially greater than those observed by DNA microarray analysis. However, with the exception of the prolyl 4-hydroxylase α subunit (P4HA2) and C1orf29, which displayed a 1000- and 340-fold increase, respectively, in Raji cells, the genes showed between 2.9- and 38-fold changes in expression. In contrast, HLA-DRA, which is completely dependent on CIITA for its activity, displayed an ∼89,000-fold change with the amount of cDNA used in the PCR. This suggests two points: 1) basal expression of the non-MHC class II genes is independent of CIITA as the expression of these genes is significant in RJ2.2.25 cells; and 2) if CIITA is regulating these genes through the class II regulatory pathway, then the regulation is similar to that of MHC class I genes, i.e., a modulatory mechanism. In a similar fashion, real-time RT-PCR analysis confirmed the down-modulation of eight genes that were tested (Table VII⇓). Thus, at this level of analysis, the DNA microarrays have faithfully identified genes whose expression levels are different between the two cell lines. Although the above analysis allows a direct comparison of the RNA levels of each of the gene transcripts, it does not link CIITA to these changes. Additionally, non-CIITA-mediated affects may be present due to the initial mutagenesis and cloning procedures or drift that occurs with cells in culture. Therefore, to provide evidence that the fold changes were due to CIITA, an RJ2.2.5 cell line stably complemented with a wild-type CIITA expression vector was analyzed for its ability to express or repress the genes examined in Table VI⇑. In comparison to Raji cells, this cell line, termed RJ-CIITA (8), expresses ∼8- to 10-fold less HLA-DRA mRNA (Table VI⇑). Real-time RT-PCR analysis was performed on RJ-CIITA RNA samples and compared with RJ2.2.5 samples (Table VI⇑). The results were sorted based on the fold change in RJ-CIITA vs RJ2.2.5. The upper portion of Table VI⇑ identifies genes that are clearly reverted in the complemented RJ2.2.5 cell line, suggesting that they are indeed regulated by CIITA. Genes up-regulated <1.8-fold were placed in the “gray zone”, indicating that CIITA’s role in regulating their expression is not clear. Genes placed below the gray zone showed no induction by CIITA in the RJ-CIITA cells and are probably not regulated by CIITA. Of particular note were the prolyl 4-hydroxylase α II subunit (P4HA2) and C1orf29 genes, which displayed a 1000- and 338-fold difference, respectively, in expression between Raji and RJ2.2.5 cells, but were not complemented by CIITA, suggesting that the genes are either deleted or that their regulatory pathways are mutated in RJ2.2.5 cells. Among the genes down-regulated by CIITA (Table VII⇑), protein tyrosine phosphatase (PTPRR) is strongly down-regulated by CIITA. Interestingly, the suppression of this gene by transfected CIITA was greater than that in the initial Raji cell comparison. Other genes down-regulated by CIITA were cytochrome p450 oxidase (CYP2A4), glycoprotein M6A (GPM6A), and kallikrein (KLK1). The expression of most of the other putative down-modulated genes including the ESTs matching the IgG-like sequences were analyzed, but were not repressed by the transfected CIITA gene. An important finding from MHC genomics is that the human genome contains at least three regions paralogous to the MHC (33, 34, 35). These regions map to chromosomes 1, 9, and 19. Analysis of the genomic location of the CIITA up-regulated genes from Table VI⇑ provided a surprising result in that many of the genes were clustered to the same genetic location: 1p34-35. This included the genes encoding TGF-βR-interacting protein (EIF3S2), RbAp48 (RBBP4), importin α 7 (KPNA6), tyrosyl tRNA synthetase (YARS), and polyhomeotic homolog 2 (EDR2). The only exceptions to this were HDAC1 and RNF11, which are also located in this region, as their levels were not restored in the RJ-CIITA cell line. The fold changes for the genes regulated by CIITA in 1p34-35 were modest in comparison to the class II genes. When the rest of the up-regulated genes were analyzed for chromosome location, an even larger number was found to map to the same locus (Table IV⇑). To determine the relative positions of the genes that were localized to chromosome 1, a fine map of the position and orientation of the genes was generated using both the Celera and National Center for Biotechnology Information-GenBank human genome databases (Fig. 1⇓). For comparison, the syntenic region of murine chromosome 4 is also presented. The positions of genes identified in Table IV⇑ that mapped to other areas of chromosome 1 are also shown. The finding that these genes mapped to a very close region on chromosome 1 suggested that they may be regulated in concert by CIITA and that this region may also be paralogous to the MHC. Induction of genes by IFN-γ. A431, an epithelial carcinoma cell line, was treated with IFN-γ and RNA prepared at 0, 24, 48, and 72 h. Real-time RT-PCR of the genes was conducted and the data normalized to GAPDH expression. Fold changes shown are mean values from three independent experiments and the SEs are indicated. For the down-modulated gene PTPRR, results are expressed as percentage of decrease upon IFN-γ treatment, compared with untreated cells (100%). An important concern from these findings was whether this region in RJ2.2.5 was deleted during the creation of this cell line or whether Raji cells contain an amplification of this region. Although complementation of RJ2.2.5 cells with CIITA reverts the expression of these genes, suggesting that the genes are in fact regulated by CIITA, quantitative real-time PCR of genomic DNA was used to determine whether there were gross differences in copy number of four genes within this locus (EIF3S2, YARS, RBBP4, and EDR2). Four concentrations of genomic DNA isolated from Raji and RJ2.2.5 cells were analyzed and compared. The amount of GAPDH and HLA-DRA DNA present in each cell line was also determined as controls. Taking into account the limitation of this technique and the aneuploidy associated with cultured EBV-transformed B cell lines, there appeared to be no gross difference in copy number of these loci between the two cell lines (data not shown). The data presented so far suggest that CIITA modulates expression of a diverse set of genes in B cells. To address whether this effect is cell-type specific, a random selection of up-modulated genes was tested for their ability to respond to IFN-γ in a non-B cell line. IFN-γ induces the expression of CIITA in non-APCs. Thus, genes regulated by CIITA should in principle be regulated by IFN-γ. A431, an epithelial carcinoma cell line, was treated with IFN-γ and RNA was prepared 24, 48, and 72 h later. Five genes from chromosome 1p34.1, one from 4p16 and 19q13, and one gene down-regulated by CIITA were chosen for RT-PCR analysis. The genes included TGF-βR-interacting protein (EIF3S2), tyrosyl tRNA synthetase (YARS), importin α 7 (KPNA6), polyhomeotic 2 homolog (EDR2), KIAA0807 (MAST205), SH3-binding protein (SH3BP2), RAB4B, and protein tyrosine phosphatase (PTPRR). The data were normalized to the level of the GAPDH mRNA, which did not change significantly between different time points of IFN-γ treatment. All the genes up-regulated by CIITA were also induced by IFN-γ, with maximal levels at 72 h of treatment (Fig. 2⇓). RbAp48 (RBBP4), which was shown to be up-regulated by CIITA (Table IV⇑ and VI⇑), has been previously shown to be up-regulated by IFN-γ (36). Protein tyrosine phosphatase (PTPRR), the gene down-modulated by CIITA, was also down-modulated by IFN-γ. Both SH3BP2 and RAB4B were significantly up-regulated after 24 h of IFN-γ treatment in comparison to the levels in Raji vs RJ2.2.5. These observations verify the Raji/RJ2.2.5 data sets and indicate that CIITA globally regulates cellular gene expression. 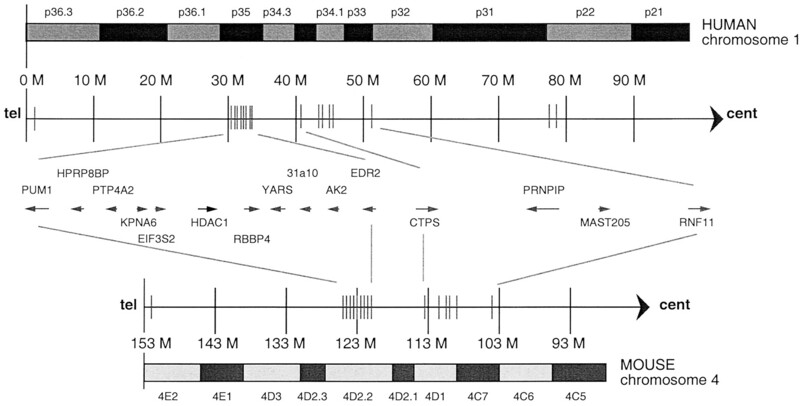 Mapping of novel CIITA-regulated genes to chromosome 1p34-p35, an MHC paralogous region. A fine map of the position of the genes up-regulated by CIITA on chromosome 1 was generated using both the Celera and National Center for Biotechnology Information-GenBank human genome databases. The respective locations of the genes and the transcriptional orientations of these genes are shown. For comparison, the syntenic region of murine chromosome 4 is also presented. CIITA is a master regulator of MHC class II expression. Its ability to also regulate the expression of invariant chain, DMA, and DMB, as well as DOA, suggests that CIITA expression controls the Ag presentation pathway. The finding that some genes are down-modulated by CIITA overexpression (25, 26, 27) suggested that CIITA may impact the general physiology of cells. Thus, to identify potentially novel Ag presentation pathway and other genes regulated by CIITA, DNA microarray analysis was used. The use of DNA microarrays provides a snapshot of the RNA profile within a cell type or line. Although this technology is limited by the diversity of genes on the microarray chip, it can allow a direct comparison of the expression profile between two closely matched cell lines or cells that have been treated with a stimulant. In the current study, Raji (CIITA expressing) and RJ2.2.5 (CIITA null) were chosen, as RJ2.2.5 is a daughter line derived from Raji. Thus, these cells should be genetically similar with minor differences arising from the initial mutagenesis and selection schemes. To verify the microarray results, real-time RT-PCR on 43 genes was used. This analysis demonstrated that all the genes identified did indeed vary in their expression between the two cell lines. Comparison to an RJ2.2.5-CIITA revertant eliminated some of the genes from the initial set. Even so, a large number of genes whose expression was modulated by CIITA remained. The classification of genes into functional groups, using the annotation associated with various databases and the existing literature, resulted in an enormously diverse set. This suggests that while CIITA is exclusively required for MHC class II genes, CIITA likely has a broad role in the entire pathway of Ag presentation and even the downstream events following Ag recognition. The process of Ag presentation includes the following events: engulfment of Ag, targeting the Ag to endosomal vesicles, processing/degradation of the Ag, and presentation on the surface of the cell. Following recognition of the Ag by a specific helper T cell, B cells are stimulated to proliferate and differentiate. All of these individual processes are potential targets of regulation. Genes whose products function in processes related to the above events were found to be regulated by CIITA. Although it is not known if these genes actually participate directly in the Ag-processing pathway, it is important to consider potential roles for these gene products in these pathways. The discussion below speculates on how the CIITA up-regulated genes could play a role in the above processes. APCs must traffic between areas of infection and secondary lymphoid tissues. YARS, a tyrosyl-tRNA synthetase found to be regulated by CIITA, may participate in such events. YARS is essential for protein synthesis. During apoptosis, YARS is secreted from cells and cleaved by elastase into two fragments, each with distinct cytokine activities (37). The C-terminal domain of YARS displays potent leukocyte and monocyte chemotaxis activity, and stimulates production of myeloperoxidase, TNF-α, and tissue factor. The catalytic amino terminal domain (p43) fragment binds the IL-8AR and functions as an IL-8-like cytokine (38). Thus, the induction of this gene by CIITA during exposure to IFN-γ may provide chemotaxis signals for the recruitment of APCs at sites of inflammation. Four of the genes are associated with vesicular or membrane trafficking and could function separately or together in Ag processing. RAB4B is a member of the Ras superfamily. Rab proteins are small GTPases involved in the regulation of intracellular membrane traffic in mammalian cells (39). The STM7 kinase (PIP5K1B), a phosphatidylinositol kinase family member, is suggested to be involved in vesicular trafficking (40). KIF3B, a microtubule-based kinesin family member functions in anterograde translocation of membranous organelles (41); and MAST205, a microtubule-associated Ser/Thr kinase (42), may function with KIF3B. Following stimulation by T cells, B cells clonally expand, mature, and differentiate. Therefore, it is reasonable to expect that signaling molecules would be up-regulated so that the maximal response to such stimulation could occur. ISGF-3, better known as STAT1, a required component of IFN signaling, is up-regulated. This may serve in some autoregulatory loop, which enhances responses to IFN. ITCH, an E3 ubiquitin ligase, may participate in regulation of Th2 immune responses by modification of NOTCH signaling (43). Several genes could be linked to proliferation. Genes involved in mitosis such as CDC20 (44) and those encoding phosphatases such as PTP4A2, which when overexpressed lead to cellular transformation (45), may be important as B cells receive signals from helper T cells to proliferate. The SH3 binding protein, SH3BP2, which is the genetic basis of cherubism and negatively regulates c-abl, may also play a role in controlling B cell proliferation (46). Additionally, two genes involved in purine and pyrimidine biosynthesis, adenosine deaminase and cytidine 5′-triphosphate synthase, were both up-regulated. Two of the factors up-regulated by CIITA could have broad roles on the ability of B cells to differentiate. Importin α 7 is one of several isoforms of importin α, a major component of the nuclear protein import machinery. The importin β/importin α 7 heterodimer is also the functional nuclear import receptor for histone H1 (47). The role of CIITA in up-regulating importin α 7 could be speculated to enhance nuclear import of CIITA, the import of other regulatory proteins, or potentially the import of proteins into other organelles within the cell, such as the lysosomal transport of proteins during Ag presentation. RbAp48 (RBBP4) was also reported to be up-regulated by IFN-γ (36). RbAp48 is found in several chromatin remodeling complexes that contain histone deacetylases, including HDAC1 and HDAC2, suggesting a role for this protein in the silencing of gene expression (48). In addition to its presence in deacetylase complex, RbAp48 has also been shown to associate with CREB-CBP complexes, which are generally thought to function in activating gene expression (49). Thus, RbAp48 is part of several complexes that facilitate histone modification during transcriptional activation. Among the proteins down-regulated by CIITA, protein tyrosine phosphatase (PTPRR) and glycoprotein M6A (GPM6A) were greatly affected. PTPRR is a receptor-type phosphatase. The homologous gene predominately expressed in mouse brain (PTP-SL) was found to associate with and regulate the activity and cellular localization of mitogen-activated protein kinases (50). Similar to PTPRR, GPM6A is also a neuronal protein. GPM6A is a cell surface glycoprotein expressed on neurons in the murine CNS that plays a significant role in neural cell adhesion and some aspects of neurite growth (51). The physiological link between CIITA and these neuronal proteins demands further study. However, it is possible that the down-regulation of these regulatory proteins in cells expressing CIITA induced by IFN-γ exposure may allow these cells to prepare themselves for innate immune responses to inflammation in neuronal tissues. Other genes down-regulated by CIITA were kallikrein 1 (KLK1), a serine protease, and a subunit of cytochrome P450 IIA4 (CYP2A4). The expression of cytochrome P450 has been shown to be down-regulated by IFN-γ through transcriptional and posttranscriptional mechanisms (52). The data presented in this study suggest that down-modulation is mediated by the induction of CIITA. In considering the potential mechanisms for how CIITA may be controlling the expression of this diverse set of genes, there is a single point that must be stressed. In comparison to the classical class II MHC genes where CIITA regulates their expression fully, the expression of the identified genes appears to be only modulated by CIITA. This modulation is analogous to the regulation of MHC class I genes, which are constitutively expressed in most cell types, but up-regulated by CIITA produced after exposure to IFN-γ. Fig. 3⇓ depicts four distinct pathways/mechanisms that could be involved in CIITA-mediated gene control. Models of CIITA action. Four models are proposed. 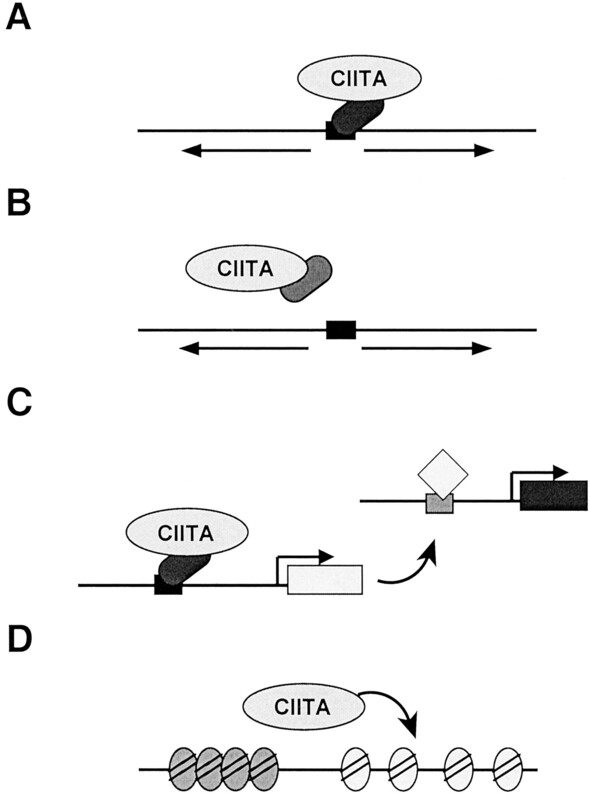 They include: A, CIITA interacts with DNA bound transcription factors to control gene expression; B, CIITA sequesters or titrates a factor important for repression or activation of a gene; C, CIITA activates the expression of a transcription factor or activator; and D, CIITA or one of its induced genes is involved directly in the chromatin modulation of a region or a specific gene. In the first pathway, CIITA directly interacts with the regulatory region of a gene. This is akin to the MHC class II pathway in which CIITA interacts with the DNA-bound factors, RFX, X2BP/CREB, and NF-Y. Computer searches of the 10 kb of sequence upstream of the transcription start site of a number of the genes were performed to identify potential class II regulatory motifs. Numerous NF-Y and CREB/ATF sites were identified, which could play a role in CIITA-mediated regulation. However, these sites are relatively common, and until these sites are individually tested in reporter assays, their presence is only suggestive. No motif identical with one of the various MHC class II X box (X1/X2) was identified among the genes tested. Thus, if these sequences play a role and CIITA functions through them, then it is possible that without the full X1, X2, and Y box motif, the binding of CIITA is weak; and therefore, only moderate changes in expression would be seen. This could be particularly valid for the genes on chromosome 6 such as β tubulin, HSP70-2, and TAP1, which have low homology X-boxes. Direct interactions between CIITA and a non-MHC class II gene-specific DNA-binding protein is also a possibility. CIITA has been found to interact with many proteins; hence, this remains a formal and potentially exciting possibility. The second proposed pathway represents an indirect effect of CIITA expression. In this example, CIITA could sequester a positive or negative regulatory factor. CIITA’s ability to down-modulate Fas ligand and IL-4 is prevented when CBP is overexpressed in the system (25, 26). These data suggest that CIITA has the potential to down-regulate the expression of genes whose transcription factors may have a weaker affinity for certain coactivators. This mechanism may be responsible for the down-modulation of PTPRR and the other down-regulated genes identified in this study. Conversely, CIITA may be able to titrate a negative regulatory factor/repressor from a gene. In this regard, CIITA would not have to interact at the regulatory region of a gene, but could have a global affect on a subset of genes that would be detrimental to either the IFN-γ response or to Ag processing. In the third pathway, CIITA could regulate the expression of a transcription factor involved in gene expression. As with the above pathways, this too allows CIITA to control the expression of a set of genes. It is intriguing that CIITA was found to modulate the expression of STAT1, ETS2, and DEC1. Perhaps these factors are involved in the regulation of some of the genes identified. Of course, this opens up the potential for regulatory circuits and loops. Lastly, CIITA, which was found to regulate the acetylation of histones at the HLA-DRA promoter, could potentially regulate the opening of chromatin at other loci. This could happen in several ways. Due to CIITA’s ability to bind CBP/p300 and p300/CBP-associated factor, if recruited to promoters or locus control regions, CIITA could bring with it a variety of histone-modifying proteins. It was intriguing to find that RbAp48, which is part of several chromatin-remodeling complexes (48, 49), was found to be regulated by CIITA. Although it is not known what effect changes in RbAp48 mRNA levels could have on the function of such remodeling complexes, it is possible that a CIITA-mediated increase in RbAp48 complexes could lead to changes in gene transcription of some of the genes in the set. Lastly, because many coactivators are found in complexes with other proteins, the possibility exists that CIITA will be part of one or more complexes within the cell that regulate chromatin or loci, thereby regulating genes in this manner. The Raji/RJ2.2.5 analysis identified a cluster of genes on chromosome 1 that were up-regulated by CIITA expression. Evidence from recent genomics has suggested that chromosome 1q22-23 and 9q34.3 contain multigene segments of DNA that are evolutionarily related or paralogous to the MHC class II and III regions on chromosome 6 (35). Chromosome 1 appears to have undergone a pericentric inversion, which led to paralogous regions in both its arms (53). The gene cluster on chromosome 1p34-35 modulated by CIITA from our microarray data falls between two paralogous genes on chromosome 1, LYPLA2 (chromosome 1p36), and PPT1 (chromosome 1p32; Ref. 53). On chromosome 6, the paralogs of these genes flank the MHC class II region (53). Some of these genes modulated by CIITA were also found to be regulated by IFN-γ in a fibroblast-like cell line. It is important to note that this cluster spans >15 mb of DNA. As mentioned, a search for highly homologous X1-X2-Y box regulatory sequences within several of these genes was not successful. This result coupled with the fact that the genes are only modulated by CIITA suggests that these genes may be regulated by a novel mechanism involving CIITA. It is possible that this region is controlled by a locus control region that is responsive to CIITA following any of the paradigms suggested in Fig. 3⇑. In conclusion, a novel set of genes that are potentially regulated by CIITA have been identified. The scope and functional diversity of these genes suggests that CIITA expression has a global effect on a cell’s physiology and gene expression profile. We thank members of the laboratory for comments during the course of this work. We acknowledge the help of the Emory University DNA Microarray Facility (Atlanta, GA) in the facilitation of this work as well as the Emory Biomolecular Computing Resource in the analysis of this data. We also acknowledge the help of Dr. Terry Lee in screening the databases for X box sequences. ↵1 This work was supported by National Institutes of Health Grants AI34000 and a supplement to GM47310. ↵3 Abbreviations used in this paper: CIITA, class II transactivator; HSP, heat shock protein; CBP, CREB-binding protein; EST, expressed sequence tag. Sambrook, J., E. F. Fritsch, T. Maniatis. 1989. Molecular Cloning, A Laboratory Manual Cold Spring Harbor Laboratory Press, Cold Spring Harbor, NY. Ausubel, F. M., R. Brent, R. E. Kingston, D. D. Moore, J. G. Seidman, K. Struhl. 1987. Current Protocols in Molecular Biology Wiley, Boston.